GSBI® In-residence accelerator helps social entrepreneurs manage risk and multiply their impact. The GSBI® accelerator is Miller Center’s signature program and is for the highest potential social enterprises we can find. Participating organizations have proven traction and potential to scale their impact dramatically. This program typically supports organizations that have been in operation for 5+ years, with a staff teams as small as 5 and as large as 500, who have served thousands or tens of thousands of customers/beneficiaries since founding. This program is centered around a 10-day in-residence boot camp and pitch session at Santa Clara University, and also includes 10 months of virtual mentoring and online support. We connect you with seasoned, executive mentors who will accompany you for nearly one year to develop the operational excellence and investment readiness required to scale your impact. Together starting in January, you will develop and build upon your impact model, business model, growth plan, financial model, and operating plan. In August, you will come together with the rest of the cohort and Miller Center / GSBI® community for deep dives into the most critical components of your theory of change and path towards scale for a 10-day in-residence at Santa Clara University. Silicon Valley’s most committed and experienced business executives and invited social enterprise experts from around the globe will come together to provide you with constructive feedback in a high-octane, supportive environment. At the GSBI® Investor Showcase you will present your business opportunity to hundreds of potential investors and supporters. Miller Center will provide investment facilitation support by connecting social entrepreneurs to our robust network of investors in the impact ecosystem, including grant funders, drawing upon our rich database of over 500 impact investor organizations and active relationships within the investment community. Look through the In-residence Syllabus and check out the daily agenda for the 10-day in-residence at Santa Clara University. 93% of the participants in the 2016 GSBI® accelerator cohort raised funding within six months of the program concluding. 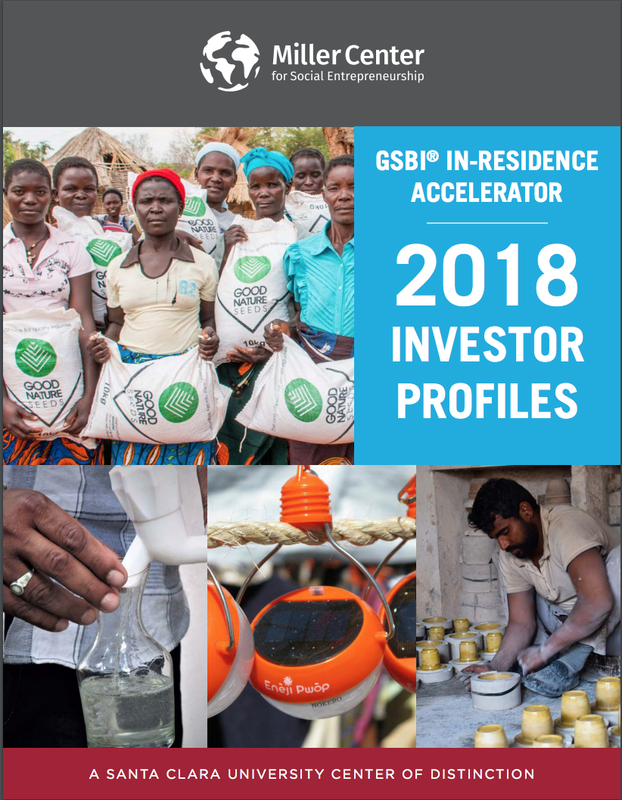 To learn more about our most recent GSBI® accelerator cohort, take a look at their Investment Profiles, featuring 2-page overviews of program participants.